12:04: Mansur Gavriel? Yes or No? Mansur Gavriel? Yes or No? So after making the dumbest mistake a couple months back and actually acquiring a Mansur Gavriel bag, I decided to branch out and get it in brown. Not just any brown, but light brown. Ugh. Mistake! I promptly returned it and have been regretting it ever since. I've always wanted a black one, but I'm wondering if it's just hype and over-exposure that's making me want one so badly. I can tell you for sure it has a very luxurious quality, if not stiff, feel. And I can see the downside of having the drawstrings be the only barrier between making it a bucket shape or a tote. But is it classic enough to order again? 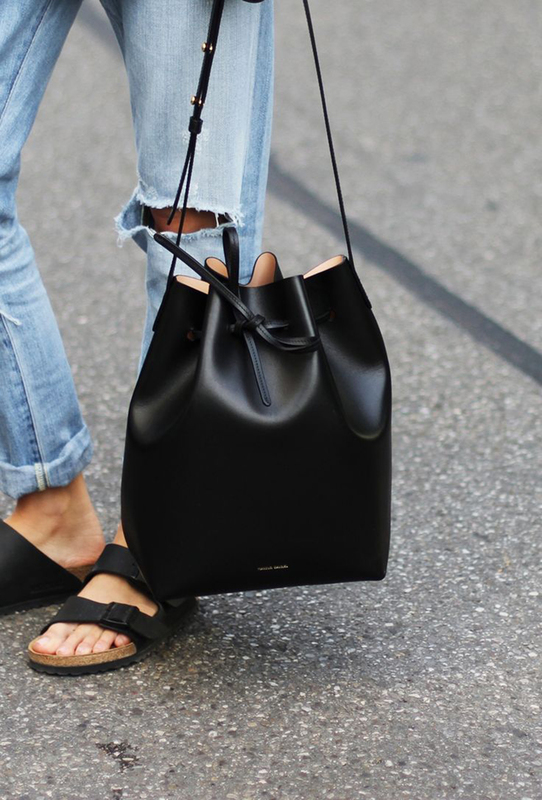 Mansur Gavriel just launched their e-commerce site which means the hardest bag to find is now readily available. The question is: do I still want it? Excellent point. I love the design so much I'm literally kicking myself for not getting it in black. If you don't keep the large one, would you be interested in selling it to me? The Mansur Gavriel site is sold out again! This is how I feel about Birkenstocks right now; I've long been anti-Birk, but their ubiquity and hype has got me reconsidering. Conflicted! Yet so comfy (...or so I hear). I quite like this bag in black (more so than the brown). But if the functionality still falters in your eyes, a change in color won't change that. I think the design is timeless, and I wouldn't mind a sans-zipper closure, but I know that's a highly personal preference! Ugh. I'm trying to resist Birkenstocks so hard right now. They just seem so unwearable at work! They are super wide, this I know from experience trying on a pair. I think the Birkenstock/shower shoe look works best when it's a little more streamlined, no? Love the bag in black. Experiencing some #FOMO right now when it comes to the bag. Yeah, Birkenstocks are a total no-go in my business attire office, so they would be relegated to being weekend warriors. And I agree with the streamlined look. I bought a pair of Joie's Sable sandals to fit the bill instead! I say wait for as long as you can muster before pulling the trigger on the bag; it's a big expense, girl! Agreed! I think I blog about things I want more often than I indulge myself. Almost as if talking about it with people who are equally obsessed can help diffuse the "need" for it. You know? I love the bag in black, but the leather is so stiff it makes a lot of noise when you walk and when you open and close it. That is the only drawback, there is no question that the style is classic and beautiful. YES totally agree. I found the leather to be really stiff too! I wonder if it will hold up to the wear and tear of normal use.